This millionaire was studied by today’s world-class personal development gurus — including Harvey Mackay, Les Brown, Tony Robbins, Mark Victor Hansen, and Brian Tracy. His message is profound, easily applicable, and will get you results! Jim Rohn was not extraordinary at all — he was a very ordinary man. He was raised in obscurity on a farm in Idaho. He went to college for one year before dropping out because he thought he was "smart enough." He married soon afterwards and started a family. And he was a hard worker. But it didn't do him any good. Even though he worked hard at his job, he couldn't pay his bills. Creditors started calling, and he didn't know what he was going to do about it... In fact, once he became physically ill for two days because he lost a $10 bill. How does your background compare with Jim's? He wasn't born with any natural advantages — were you? He didn't possess any remarkable talents — do you? And he certainly didn't make a lot of money. Yet this man went on to ignite a success revolution. Those who learned from him, and applied what they learned, became some of the wealthiest, most respected, most influential, and happiest people in the world today. I don't know about you, but I'm very curious how this "Average Joe" could find himself in a position years later in which a company calls him up on the phone and offers him millions of dollars for his assistance. It just doesn't seem to add up. So there Jim was, working his tail off and not getting anywhere. He soon realized that it was going to take more than hard work to improve his situation. After all, he had a family to support. The thought occurred to him that he should go back to school. One year of college didn't look so good on an application. But with his family starting, going back to school was a tough decision. "Maybe I should start my own business," he thought. But he didn't have any money to do that. So that's where Jim was at age 25 — behind on his dreams and constantly wondering what he could possibly do to change his life for the better. Well, at age 25, good fortune came his way. He met a mentor named Earl Shoaff, who was a unique and very successful man. Shoaff was the man who told Jim Rohn a secret that transformed Jim's life forever and set him up to receive a telephone call years later worth millions. It's the secret that can do the same for you. There was one thing Shoaff taught him that had particular impact. In fact, it transformed Jim Rohn's life and made him a rich man. Early in their relationship, Shoaff said, "Here's the secret to becoming worth millions..." And then, he told him what that secret was. "If you do what most people will tell you to do, you'll make a living," he said. "But if you follow this secret instead, you'll make a fortune." Once Jim got that, it turned his life around. Now, if you would have known Jim Rohn at age 25, you would have said, "Jim's a hard worker." He was a guy who didn't mind coming in a little bit early, staying a little bit late. He didn't mind that. He was a hard worker. So how come he had pennies in his pocket and nothing in the bank? Why was he behind on his promises? Because he wasn't following the secret yet. If you had asked him back then why he was having such a hard time, Jim would have said it was the economy. Taxes were too high. It was traffic. It was the weather. It was circumstances — after all, he was raised in obscurity on a farm and his parents didn't have money. And his number one reason was the company he worked for. It was the company's fault he was not doing better because when they pay so little how could they expect him to do well? Earl Shoaff taught him to look at the situation differently when he told him the secret. At age 25, Jim Rohn was broke. By age 31, he was a millionaire. But at the end of the second six years of his economic life he was a millionaire. Strangely enough, the government was about the same. The economy was about the same. His negative relatives were about the same. Taxes were about the same. Prices were about the same. Circumstances were about the same, and everything else was about the same. Then why did he get rich? How did he totally change his life? Jim Rohn was not the same. He was the one who changed. And that made all the difference. You see, Jim Rohn was as astonished at his sudden change of fortune as everyone else. He knew why he had changed. He knew what caused it, because Earl Shoaff had taught it to him. But he was blown away by the incredible impact of Shoaff's teachings. He was astounded as he saw himself transformed from penniless to a millionaire in only six short years. Can you imagine becoming a millionaire in such a short amount of time? Jim Rohn realized how lucky he was to have a mentor who gave him such powerful knowledge. He also realized that many people are not as lucky. Many go through life without ever having any mentor, much less one who could make them a millionaire in only six years. And that's why Jim realized he needed to share the secrets Earl Shoaff had taught him. So at every opportunity, he began sharing the ideas that had transformed his life. You already know that Jim Rohn was one of the most popular and most well-respected speakers in the field. What's best about him is that he never set out to be a speaker. He carved his success in the real world before he ever said a word to anybody. In my opinion, that gives him a lot of extra credibility. One other thing about Jim Rohn you should know — he didn't believe in motivational "rah rah." Instead, he was all about the simple, practical things you can do on a daily basis to transform your life. Earl Shoaff was a businessman. Jim Rohn was a businessman. Efficiency is at a premium in the business world. You want to get the strongest possible results in the shortest amount of time. The secrets of Earl Shoaff took Jim Rohn from a "nothing-aire" to a millionaire in only six years. How's that for effective? How's that for efficient? And you will find a powerful collection of those same secrets in Jim's audio program, entitled The Art of Exceptional Living. The core of this program is centered around the secret that set Jim Rohn up to receive the telephone call worth millions. But clearly, there are ways of working on yourself that are more effective than others. In the spirit of Earl Shoaff, The Art of Exceptional Living separates the wheat from the chaff, and it gives you only the most powerful ideas that will generate the strongest results for you in the shortest time possible. It's like having your own multimillionaire mentor take you by the hand and show you exactly what you need to do to follow in his footsteps. Follow the guidance the program offers, and you will walk a new path that could end with your receiving your own million-dollar phone call. Follow in Jim Rohn’s footsteps — gain the ideas and mindset to become a millionaire in just 6 years! You can order today and SAVE 78%! How a single word, when applied correctly, functions like a set of magic keys that unlocks all the doors of wealth, happiness, sophistication, culture, high self-esteem, pride, joy, accomplishment, satisfaction, and success. How to open the doors to receiving more of the wealth the world has to offer, and the one thing you must avoid in order to prevent those doors from closing. How to build the strongest possible foundation for achievement, productivity, and the lifestyle you dream of having. Once the foundation is set, you'll weather any storm. Why success doesn't have any mysteries or exotic answers but is a very basic process anyone can achieve. Why focusing on only a half-dozen things can make 80 percent of the difference in your performance. The bridge between thought and accomplishment, inspiration and achievement, necessity and productivity. Anyone can have a good idea. But in order to reap the benefits of that idea, you must find a way to connect it to a practical application. This bridge is the key to executing your ideas so they work for you. The knowledge you'll gain from this program is staggering — not because it's so complex, but because of the incredible impact a few simple actions can have on your life when you do them. Imagine how terrible it would be to wind up at the end of your life and find out you only lived one-tenth of it and the other nine-tenths went down the drain. If this happens to anyone in this country, it's not from a lack of opportunity; it's from a lack of information. The Art of Exceptional Living will give you the information you need to take advantage of the abundant opportunities that surround you. Trust me, the opportunities are there. Once you learn from the program, you will find out how to spot them. Once you make the decision to go forward, you will be on the same path Jim Rohn started on when he was 25. And if you apply yourself to learning and acting on the secrets the program reveals, your life can be transformed as Jim Rohn's was (he went from broke to a millionaire in six short years — remember?). And then, once you've used the program to achieve your dreams, you just may find yourself enjoying your prosperity. As you sit there basking in the light of your success, suddenly the phone will ring. And your million-dollar phone call will have arrived. Is it worth investigating? If what I've said is true, it's absolutely worth it, isn't it? And I'll stake the reputation of my company on the truth of what I've said. P.S. Commit yourself to yourself. The results will be well worth it, I promise. YES, I want to take advantage of the abundant opportunities that surround me! 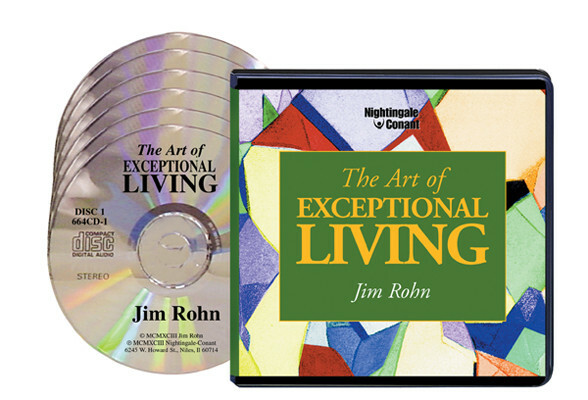 Please send me my copy of Jim Rohn's 6-CD audio workshop, The Art of Exceptional Living, at the discounted price of $49.95, which is 78% off the regular price. If I don't catch up on my success and attain all I ever wanted and needed within 30 days, I can return the program for a full refund of the program price — no questions asked!